The litter of 3 ginger kittens who have been living in Sue’s bedroom with their mum for the past 5 weeks (since they were a week old) are now all booked for new homes – the wee boy is going with his mum. Sue has set up a trap for a litter of feral kittens near Glenrothes – they are already investigating the trap so it shouldn’t be too long before they are caught & can be checked out by our vet. 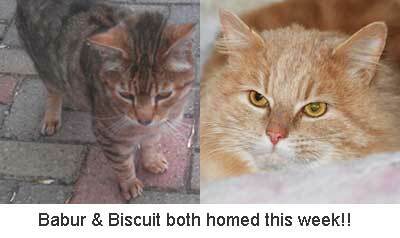 Good news for Babur and Biscuit – both have found lovely new homes this week! Sue is on a mission to make lots of lovely plum jam so if you have any plums going spare she would appreciate them & put them to good use. She had great success at Newburgh flower show last week – she won prizes for her jam and was over the moon to win first prize for her begonia! !